Is Spaceteam the perfect bar game? This week, I’m joined by Gameological contributor Derrick Sanskrit. He’s been taking his games out of the living room to play at the bar with his friends, and he thinks he found one game that might be the perfect fit for saloon-based play. Do you have any go-to bar games that aren’t your typical drinking game? Tell us in the comments, and as usual, let us know what you’re playing this weekend. Derrick Sanskrit: I’ve been having fun lately finding games that work well at the bar—games that friends can play in between drinks in a relatively dark public space when we’re already feeling silly on account of alcohol. It came up, because I turned a couple friends on to Spaceteam recently. We were out at a bar and one guy brought the game up again, and we decided to try it, full well expecting it to be a total disaster. I figured it would be hard enough to read the instructions after a few drinks and that shouting gibberish orders to one another while surrounded by strangers could only lead to trouble. But sure enough, it was pretty fantastic! Turns out shouting at your friends in a bar is just normal behavior, and nobody gives a damn what you’re saying as long as it doesn’t defame the local sports team. MG: Do you want to give a quick explanation of Spaceteam for the uninitiated? DS: Spaceteam basically simulates what it would be like manning a station on the bridge of a starship, like those scenes in Star Trek where Kirk is barking orders to Chekov, who is shouting readings to Sulu. Everyone is telling everyone else what to do, so you need to always be listening. Everybody playing gets commands on their screen, but the commands don’t necessarily correlate to the buttons and levers on your device. My screen could say “raise thrusters to 7” but the thrusters could be on your screen, Matt, so I shout out “raise thrusters to 7” and everybody looks to see who has that control. But since everybody has commands on screen at the same time, everybody is just constantly yelling at each other. It gets silly real fast. Plus it works cross-platform between iOS and Android, as long as you’re on the same wi-fi network, so almost everybody you know can play at any given moment. Oh, and it’s free. Get on it, kids. MG: It’s free, but you can opt to pay a couple bucks for some extra features, which you should, because it’s a fantastic game and its developer, Henry Smith, deserves the money. You can also back his Kickstarter, which would help fund a couple of free games he wants to make throughout the year. DS: He really does deserve it. He used to be a programmer at BioWare on the Mass Effect games, so he knows a thing or two about space command. MG: So the key here is yelling, lots of yelling. DS: Yes, basically never stop yelling until you’re safe. Then you drink. MG: I played a ton of this on long bus trips with my college pep band (shout outs to The Spirit Of Stony Brook). It gets really raucous. I would be a little shy to play it in a bar. DS: The next time we’re all at the bar, I am forcing a game. Spaceteam really is the best game I’ve played at a bar yet. We tried a few other raucous mobile games with less positive results. Bloop, which was the first Sawbuck I reviewed for Gameological, is a lot of fun. 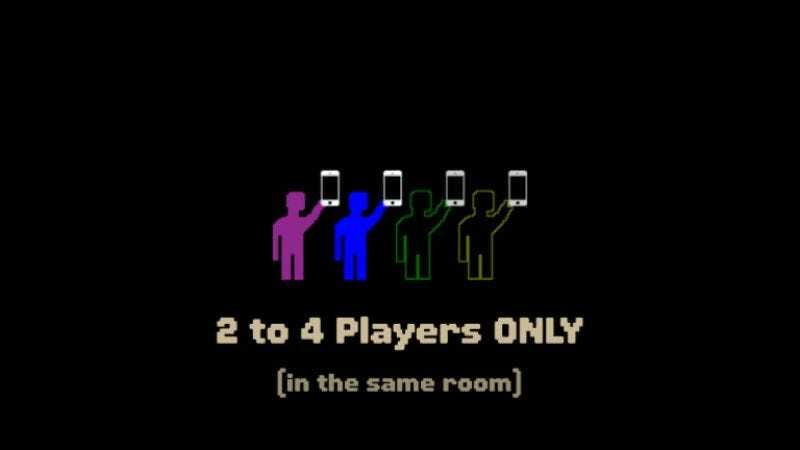 You put your iPhone or iPad on the table and every player taps the tiles of their own color, but you spend more time just preventing other players from touching the screen by any means necessary. That one’s great fun in the comfort of your own home, but in public you all just look like an embarrassment. And Bennett Foddy’s Chicanery [Note—Chicanery was originally designed by Anna Anthropy. Bennett Foddy brought the game to iOS.] is the same idea but flipped, where every player touches a corner of the screen and you do anything you can to make them let go. Last person touching wins, like those radio contests where people put their hand on a brand new car for days on end. Chicanery works while you’re, like, standing at the bar waiting for your drinks to be served, but you’re still just a couple of people shoving each other for seemingly no reason. MG: So yelling is okay, but shoving and slapping not so much. Makes sense. DS: Right. People yell at bars all the time. I almost exclusively yell at bars, because the music and other people are so loud. With Spaceteam, you’re just yelling things that sound vaguely scientific. Although with Chicanery and Bloop, it’s easier to institute drinking rules like “loser buys next round for winner.” In Spaceteam, everybody wins or loses together… as a Spaceteam. MG: Have you tried playing more traditional games at the bar? DS: We’ve tried a few, but apps really seem to work better. We’ve brought social card games, ones where you try to guess each other’s cards like Mascarade, Love Letter, and Hanabi, but cards and tokens don’t really get along too well with wobbly, uneven, and sticky bar tables. Plus, each of those games rely on remembering things that happened one or two rounds earlier, which is really hard to do when there’s that much noise and other people hanging around, not to mention the drinking. Even in the privacy of your own home, those games are hard if you’ve been drinking. MG: So Spaceteam really does seem like the perfect bar game. It’s easy to procure. There’s no cleanup and no small pieces. Worst-case scenario: You might annoy some people. Best case: Other people overhear your silliness and join in. DS: Especially when you start laughing uncontrollably, which seems to always happen. And there’s that huge sigh of relief at the end of the round, that sense of satisfaction and survival that you got at the end of every episode of Breaking Bad, like “Oh man, I can’t believe we’re all still here.” There’s a very good chance that when some stranger at the bar sees you all react with such relief, they’ll come over and ask what’s going on. And then you can show them. And then they can shout for a minute while you enjoy a cold beverage and catch your breath. MG: All right. You’ve convinced me. Other people be damned. Next time I’m out with some friends, I’m booting that back up. DS: Yes! Join our team—our… Spaceteam! Ugh, I feel awful about that. No, no I don’t.